The joy and expectation investors are experiencing as 2017 turns into 2018 is not shared by investors who are no longer in the workforce. Spectrem’ Investor Confidence Index shows that working investors are generally optimistic about the current financial atmosphere. All index categories moved up in December except for real estate investing, which reached a significant high level in November. However, at the same time, investing decisions by retired investors showed a reticence to extend investing options to benefit from the unexpected growth in the stock market. All of that being said, the Affluent Index among retired investors with $500,000 in investable assets moved up 7 points to a rating of 3, and the Millionaire index among retired investors with more than $1 million investable assets moved up 10 points to 9. In both cases, the index moved from negative territory to positive territory. Stock market investing increased for both working and retired investors, and among retired investors, 26.2 percent said they planned to invest in the stock market in the month of January. That was an almost 3 percent rise from the November percentage. For all other categories of investing strategies, retired workers pulled away, most notably in bond Mutual Fund investing, which went from 15.5 percent to 7.1 percent, more than a 50 percent drop. At the same time, 48.8 percent of retired investors said they would not be extending their investments in any way in the coming month. That was more retired investors staying out of the investment strategy than in any time in the previous six months. According to the Spectrem Household Outlook, optimism among retired investors is rising. The overall Outlook component for retired investors was 27.08, approaching the 32.00 level among Millionaires investors. That is the closest the two Outlook numbers were in 2017, and the retired Outlook was its highest level in all of the last calendar year. There was a significant rise in the Outlook for Household Income and Household Assets among retired investors. Advisors should keep an eye on retired investors, especially in good economic times. Investors who may have been staying out of the investment game out of fear of losing valuable and needed funds for the future may see an opportunity to increase their portfolio despite no longer drawing a salary. Retired investors were obviously different from working investors in what they see as a financial threat. 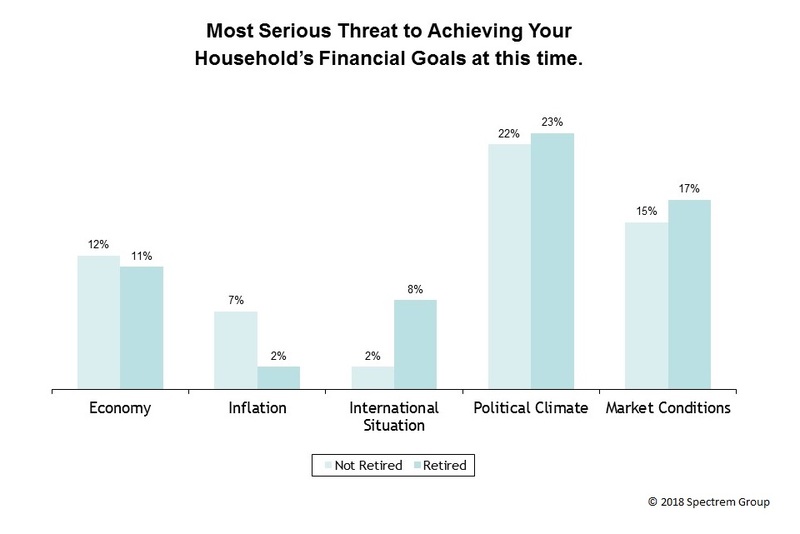 Retired investors are more likely to point to international conflicts and political issues, while working investors are more likely to point to matters that affect daily investing, such as inflation and the state of the economy.